I really love a good face scrub. Whether it’s after a long day or a great workout, a good exfoliating cleanse just feels so refreshing. But what happens to the scrub after you wash it off your face? Where do those little beads end up after traveling down your sink drain? Microbeads, the plastic particles in beauty products that are meant to exfoliate and massage our skin, have been under fire for polluting our oceans and posing a health risk to marine life. They are so tiny that they are slipping through water filtration systems. A leading force in the fight against microbeads has been the 5 Gyres Institute, who launched a 2013 study which revealed that 600,000 microbeads per square kilometer were found in the Great Lakes (Lake Superior, Lake Huron, and Lake Erie in the midwest). 5 Gyres also estimates that one single beauty product could contain over 300,000 microbeads, as such with Neutrogena’s “Deep Clean,” which contains 360,000 in one tube! Not only are microbeads polluting our bodies of water with plastic, but marine life are consequently consuming them- the same marine life we harvest for food. Yuck. Last week, New York’s attorney general Eric Schneiderman proposed the Microbead-Free Waters Act, which could become the country’s first ever ban on microbeads. A few days later, California Assemblyman Richard Bloom introduced the same bill. If passed, the act would prohibit the production, manufacturing, distribution and sale in New York and California of any personal care items containing plastic particles less than 5 millimeters in size (which is about the size of a pea). In turn, this would nudge companies to find alternative ingredients to incorporate into their products. Some companies like Burts Bees and Yes To already use natural exfoliants in their scrubs like jojoba beads, almonds, oats, and bamboo. In light of this new legislation, Johnson & Johnson, P&G, Unilever, Colgate-Palmolive, and The Body Shop have all announced that they hope to phase microbeads out of their products as early as 2015. I doubt they will be discontinuing their popular scrubs, but rather re-releasing them with new formulas. This will hopefully lead to more natural products and a healthier environment. How can you tell if your favorite scrub contains microbeads? If it does, you will see Polyethylene or Polypropylene listed in the ingredients. If you have a smartphone, you may find it helpful to download the app Beat the Microbead, which lets you scan barcodes to discover if a product contains the plastic culprits, as well as search by brand and product type. You can download the app and find a comprehensive list of products that contain and omit microbeads at BeatTheMicrobead.org. 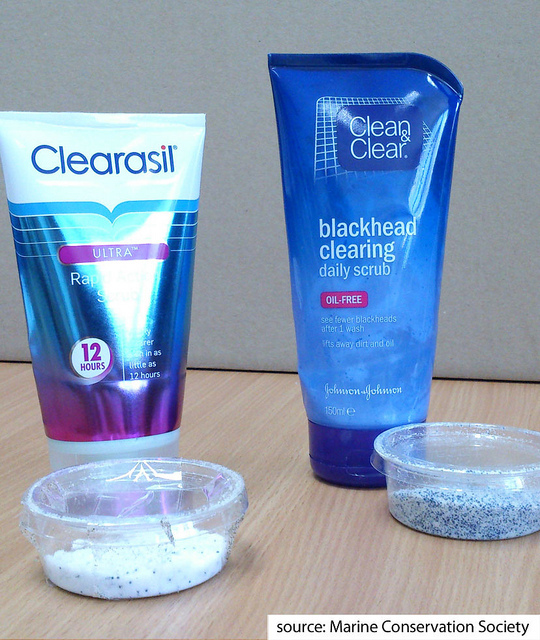 Do your face products contain microbeads? Will you be switching to a plastic-free skincare routine? Previous articleMysterious Body-licious Hair Care Trio the Secret to Goodness? Very interesting article, I am going to have to look and see. I think I am safe, only exfoliator I have left and am using is LUSH’s Angels on Bare Skin. Thanks for letting me know what to look for when I purchase another exfoliator. Hmm…This is really interesting! I think I will just stick to enzyme masks. I get the same results and no hard done to the environment. I was just discussing this with Kimmi from The Plastic Diaries. I worry that US companies might send their microbead products to countries without the law so they don’t lose profit. Hopefully not, but you can never be sure! I’m ok without microbeads, but who knew they were so dangerous in the first place! OMG I had no idea the beads weren’t biodegradable. Stupid me for just assuming that would be common sense. I am outraged! The solution is to make beads biodegradable. 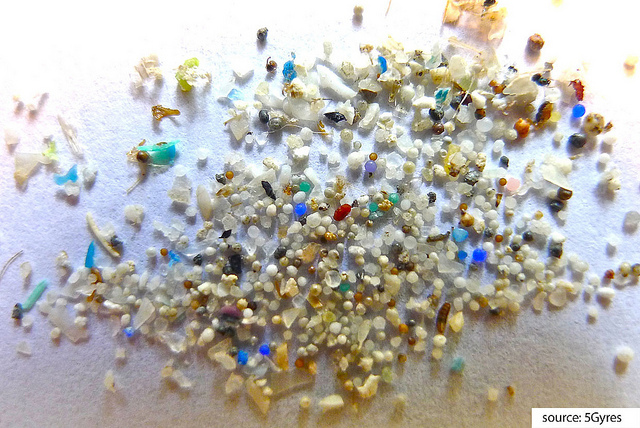 Who would’ve thought these lovely micro beads can do humongous damage to Mother Earth? Great insights! This was such a good read. Thanks for the info! I need to figure out if my favorite Clinique Exfoliating Scrub abides by the new legislation. I couldn’t live without it but I will have to find a replacement if they won’t be nice to fish! i honestly have never given thought to what microbeads actually are and what they do. thanks for this and i’ll def look into a more natural alternative! Before the announcement of the legislation, I had never thought about it either! To be honest, I thought they dissolved! I already own a lot of natural exfoliators so I will definitely be making a dent in them now. Great post! This makes me glad I prefer sugar or salt scrubs. While I think it is a great idea to remove plastics from the water table, the residue of pharmaceuticals from humans is a much bigger crisis. Interesting that the government(s) are not looking at those issues but rather at makeup. Oye. Kimberly, I just did a brief search on the issue of pharmaceuticals in water which I was not familiar with before, that IS scary. Excellent post, Miranda. Thanks for the head’s up on microbead-free products. Wow – great info! I definitely had no idea about this issue. I used to use the Clean & Clear Morning Burst facial wash that had little orange micro beads, before I switched almost 2 1/2 years ago to using the oil cleansing method. Now I use a homemade brown sugar scrub (and more recently, my Pamperosity Chocolate love scrub!!) a couple days a week when I want to exfoliate. It’s been so much cheaper and I love making my own skincare products! I was pretty oblivious to the issue before last week, as well! I know California is in a drought so we need as much usable, clean water as we can get! It’s in many toothpastes too, blue minty looking bits. You’re right Mimi! I’ve even read that dentists are advising against using Microbead toothpastes because they get wedged in between your gums! I’m sure I have lots of products with these microbeads in them only because they’re in everything! I am looking forward to the reformulation of these products to get rid of the microbeads, though – there are other solutions other than choking out our water resources. I haven’t used any scrubs with plastic microbeads -my favourite scrubs are the walnut or apricot ones. I had always imagined that those microbeads dissolve when you scrub, or turn into blue gritty powder when you rub (the one scrub I used with beads did that). Very informative post! I was also under the impression that the beads dissolved or “burst” but apparently not so! I try to avoid microbeads so I’m glad more companies are phasing them out. It’s really easy to find sugar scrubs and walnut powder scrubs, so it’s really not necessary to use plastic if you’re just after some physical exfoliation. Agreed! Plus, like Anastasia mentioned, you can always use a brush system for a really thorough exfoliation. I’ve reviewed the ToiletTree brush system which is about $40 and has face + body brushes, plus a pumice stone head for the feet! I don’t use any scrubs with micro beads, and I’m glad that they are going to be gone. I find that sugar based scrubs work better for me anyways, plus the sugar dissolves. I don’t think any of my most favorite scrubs have these micro beads. I’m glad they are doing something about this issue. I’m perfectly fine with excluding microbeads from my skincare routine, I always liked AHA non-abrasive cleansers more anyway, and I can get that extra exfoliation using a brushing system if I need it.